Based on a 10th-century Japanese folktale, The Tale of The Princess Kaguya represents for its director Takahata Isao—who has claimed that it will be his final film—an appropriately nostalgic, fanciful reconciliation of his primary themes and techniques. Animated in Takahata’s familiar blend of pastel and watercolour abstracts, the film unfolds as a kind of coming-of-age reverie, opening with a whimsical preamble depicting the unusual discovery of the title heroine, who is discovered growing from a bamboo shoot by a woodcutter. Believing the child to be of divine provenance, the woodcutter and his wife adopt Kaguya, preparing her for her royal destiny. 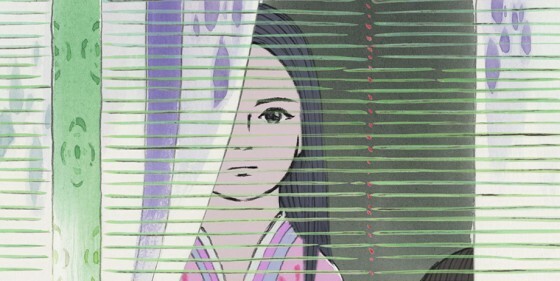 Kaguya grows into an emotionally and spiritually conflicted young woman, and her mounting melancholy and curious disinterest in suitors eventually reveal themselves to have otherworldly origins and implications. There’s a casual, intuitive feel to Takahata’s retelling of the fable: he remains faithful to his source even as the seemingly disparate genre elements which he is eventually required to implement take the film far from its humble beginnings. Thus, not unlike the resolve required of its protagonist, a certain faith on behalf of the viewer is necessary in order to stick it out through the film’s somewhat sprawling 140-minute runtime. But as with Miyzaki Hayao’s The Wind Rises—another apparent final testament from one of Studio Ghibli’s co-founders—Kaguya’s pleasures derive from the ease and elegance with which it displays the lessons learned from a lifetime’s worth of creative activity, as well as from the elegiac feeling that this may in fact be the last of its kind.